So, my dear Mr. Shulan, exactly what do you think the meaning of the "event" was? Because to me, the significance of this terrorist attack (a bit more realistic than "event", don't you think?) is that over 3,000 innocent Americans lost their lives that day. The significance is that Firefighters were willing to endanger themselves and sacrifice their lives in order to try to save their fellow man. 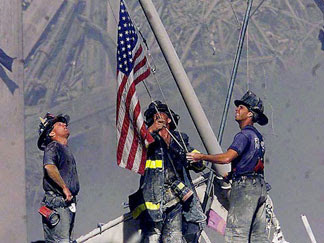 It may sound like a cliché, but we must never forget that they went up the stairs, as frightened people came down. That is worthy of our respect; and their courage and sacrifice should be honored. The significance is that this attack rocked us to our core, and made us examine who we were, and how strong we were -- both spiritually, and as a cohesive nation. You see, Mr. Shulan, I don't really care what makes America "look best", because that implies that what other countries or the world, for that matter, thinks of us matters more than the devastation, pain and loss that we suffered that day. This happened to Americans; and therefore, this is our Museum. We have a right to be vigilant about protecting our own history; it is our history. To be less than vigilant would be disrespectful to those who lost their lives that day. And I emphatically and passionately defend the inclusion of this iconic photo in the Museum. If that makes me "vehement", then so be it. And you say that this photo makes the image of what happened that awful day, "too simple"; that it distorts "the complexity of the event". Sounds to me, that you want to diminish the emotion this photo evokes; to play down the national pride that joined us all that day. Perhaps you want to make this about more than the death of 3,000 breathing human beings who didn't return to their families that day. There is a time and a place for that political discussion, but it is not at the Memorial Museum. "Memorial" implies a tribute, a testimony to one's actions, and a chronicle of our history. This photo deserves to be a part of that remembrance. And I do not think we should have to apologize for an image that celebrated our pride in who we were. Deuteronomy 31:6 "So be strong and courageous! Do not be afraid and do not panic before them. For the Lord your God will personally go ahead of you. He will neither fail you nor abandon you." When I read articles like this I feel like someone physically punched me in the stomach. It truly makes me sick. Those 9/11 firefighters gave their all. They deserve to be remembered and honored. To call it an "event" is disgusting. It was a terrorist attack. That may not be politically correct, but too bad. I hope that photo does stir national pride. I pray Americans stay patriotic. I also pray America remains a sovereign nation under God. A nation who remembers her heroes. The Progressive movement is hell-bent on denigrating America every chance they get. They simply do not see America as any better (and often times less than) other countries. Then why are there so many that want to come here? I pray for a restoration of America!